I've just bought the Nokia Asha 305. It's have great specs for me. I recommend this phone. Maybe they've make this phone using resistive touchscreen but it doesn't need to use stylus. Maybe Nokia Asha 306 is better because its WiFi support. It's speaker is also powerfull! Doesn't make any breaking sound, smooth with its own beat. I m so sad that i buy asha305 because ,it doesnt support utube & some java applications also if any body wants to buy this one i recommended plz don't. agreed with haider... Q mobile noir A2 is much better than nokia... very good fone..
Can i use fring and skype in Nokia Asha 305 ?? ans me please ... cause i want to buy this phone tomorrow !!! D nly 8vng bot asha 305 s tat it got 2l sims. Tatz ol. Nokia Asha 305 deserved this tag line: "Old Stuff in New Packing". 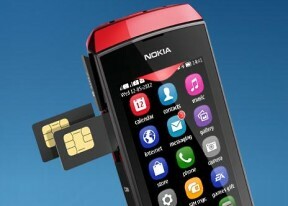 Why not buy an Android Smartphone in the same price of this Nokia (Price 8200 pak rupees). Here in pakistan, QMobile Noir A2 is available at 8800 pakistani rupees which features 3.5 inches touch capacitive screen, Android 2.3.6 version, 1GHz processor ARM v7, 173MB internal memory, 250MB RAM, 32GB card support, 3.2MP camera, VGA front camera, SKYPE video call enabled, Wifi, dual SIM standby and many many more including YouTube supported. Sovan, 24 Aug 2012This phone not sapport youtub.It doesn't support ytube so i m nt happy.